Target released their latest designer collaboration collection officially September 15 a little before 1 am PST, and people went nuts. When I first learned about the Phillip Lim collaboration back in May, I immediately logged the date in my phone calendar and set up an two different alarms just so I can be home that night to try and get things online. Going to Target was my last resort, as I don't do too well in chaotic environment. I tried not to look at too many lookbooks that they posted early on just to control my sanity and to help not think about how September 15 can't get here any sooner. I was really excited since Phillip Lim is one of my favorite designers. I've always admired his creations and wish that I can fill-up my closet with his clothes, shoes, and bags. These Target collaborations have made that (somewhat) possible for the masses to have a piece (or I guess for some people a cart load) of the designers creation, without breaking bank. Luckily, I got most of the things I wanted online before they sold out. I didn't have to participate in the early morning chaos. Although, I did send my mom a picture text of mini satchel with Gussets after making my online purchase to see if she'll be able to pick-up a black and an extra taupe one for me since her Targets were carrying the Phillip Lim collection (only select Targets released the Phillip Lim collection). There was really no sense of urgency for her to pick it up, but it was just in case she happens to be at Target and they're there. Ok now, don't judge for sending my mom out to the battlefield. My mom lives the boonies that I figured that it would be fine and less chaotic (and people are much nicer in her part of town) since I thought people won't really care or might not even know who Phillip Lim is. And Asian parents wake up early. My mom sent me a text back Sunday at 6 in the morning, three hours after I sent her the text, asking about the bag. Of course I would still be asleep. And then she texts me back again at 9 am with a picture of the bag and called me to ask if it was what I was looking for. I almost had forgotten I had asked a few hours ago to check her Target (shopping hungover). She ended up getting the black and taupe mini satchel with Gusset ($34.99), a ruffled sleeveless top ($26.99), and a leopard printed scarf ($19.99) for me. She had no idea what was going on, so I had to explain to her why people are cleaning up the shelves at Target and why are people asking her if she's "going to get that." She actually ended up getting a black and taupe tote bags and a taupe medium satchel with the handle bar for herself out of excitement. And so here we are right now. 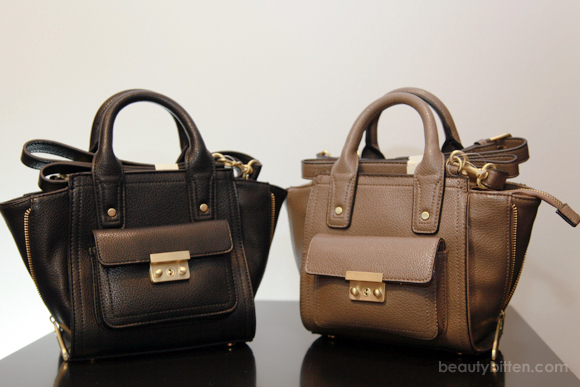 I have two of the most coveted bags in the past 24 hours sitting in my room, but are they worth the hype? As I've spent a few hours with these bags yesterday, I began to inspect every single thing about them. I even asked my boyfriend what he thought of it. It wasn't until we were taking pictures for this blog post where I've finally formed an opinion about them. I would recommend picking it if your Target still has them. Like I mentioned previously, these Target collaborations gives everyone a chance to have a piece of the designer's work in your closet. I was pretty happy that Mr. Lim decided to model his bags for this collaboration to his Pashli line. 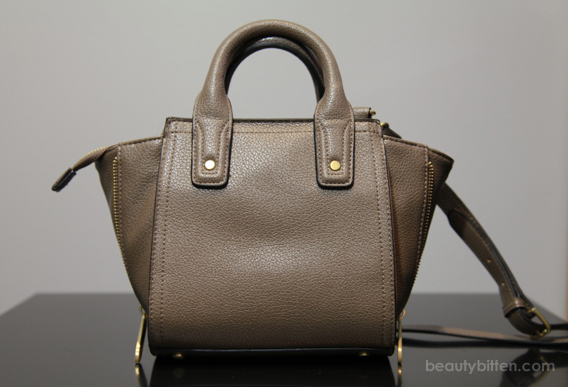 The mini satchel with Gussets is nice bag to have on casual days when you're running errands. But I don't necessarily think that it will hold up or stand the test of time as it is still a Target mass produced bag. So I'd say DON'T get it for more than what it's retailed for. 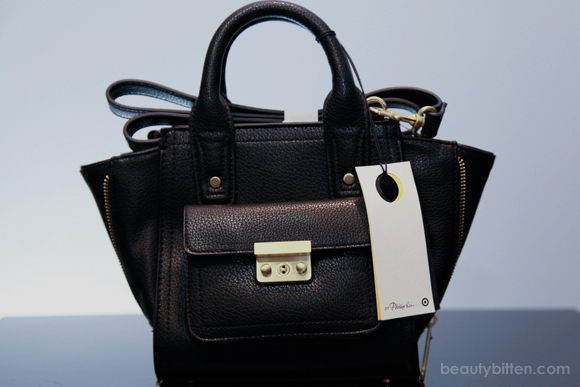 Within few hours of the release, I saw plenty of listings slowly pop up for re-sales on the bag, whether it was on eBay, Poshmark, and even on Instagram and Twitter. It's most likely that these listings are easily in the thousands now. The resellers clearly knew the hype around these bags and obviously, the smart thing to do is capitalize on the situation. These bags have been marked up almost triple the retail price. And honestly, you would be a fool to pay more than what you can get them at Target. The first thing I noticed that even the bag is designed to be a structured bag, yet it can't stand on its own. I found out about this when we were taking pictures of the bag and the bag was toppling over. The "feet" of the bag is there as an decoration to model after the the original Pashli line. I can see the side flaps of the bag looking flimsy overtime since it is not really a well structured bag and just due to the material of the bag. The flaps may become a little more pliable overtime as you use the bag more. I do like the little pocket in front of the bag. It's big enough to fit loose change or maybe your keys for easier access. 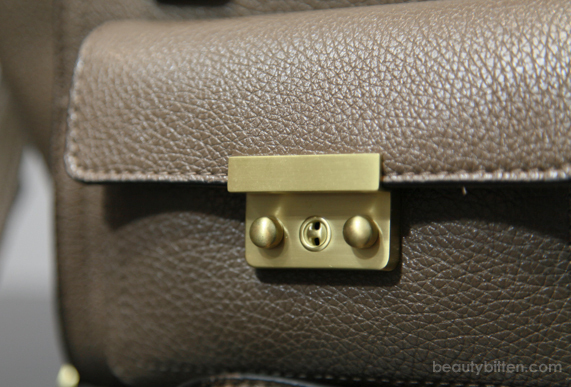 However, the metal part which was made to look like the push lock closure of the original bag is simply magnetic closure. The top part of it just has a strip of piece of magnet. 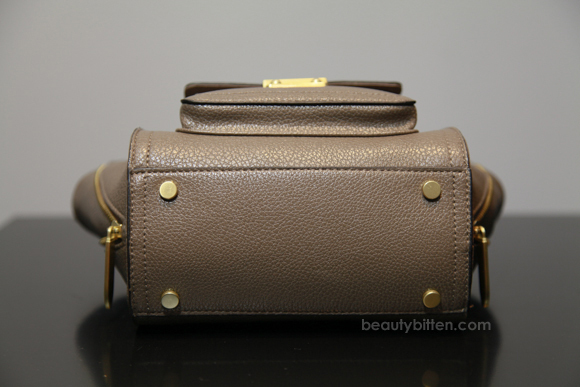 The dimensions of the bag measures: 7.5 " height x 4.5 " width x 7.38 " depth. It can easily fit a small wallet, your phone, keys, and maybe a couple of makeup essentials. It has one zipped-closure pocket in the back and one pocket compartment in front. The bag is cotton lined. The mini satchel with Gusset also has the exposed zippers, but has a top zip closure which I do prefer (for safety issues). I prefer satchels with zippers on them as opposed to having a flap closure. I've had an unfortunate experience where everything in my bag has been pick-pocketed in Vegas out of my flap closure satchel. It's much easier for pick-pocketers to access your belongings with a magnetic closure than a zipped up bag. 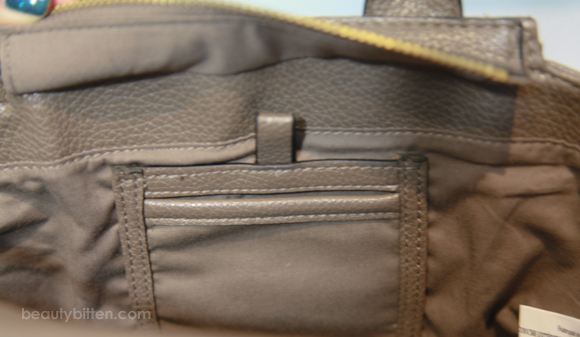 But, there are small gaps in between the end of zipper and the edge of the bag. So your belongings are still somewhat exposed in it although it's not big enough for hands to go in out of it, unless you have small and skinny hands. 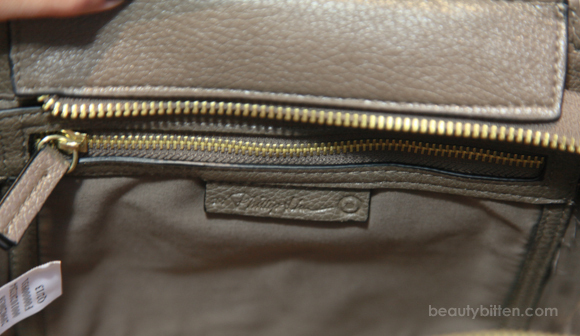 The pull tab of the zipper has the engraving "3.1 Phillip Lim" and the Target logo at the end of it. I kind found the length of the zipper slightly awkward because it's only long on one side. I think it would've been better if both ends extended out instead of just one. 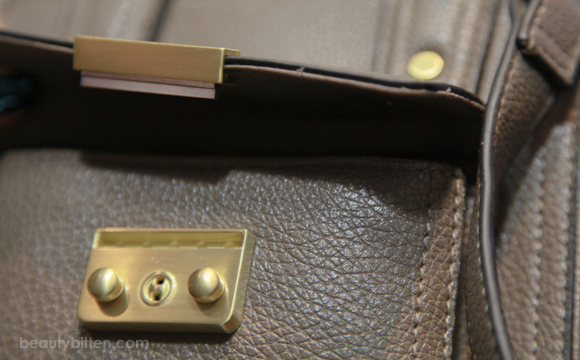 The "hardware" on the bag is painted a flat matte gold color. I'm not a fan of the color at all as it does make the bag look a little cheap. Scratches can easily become noticable. 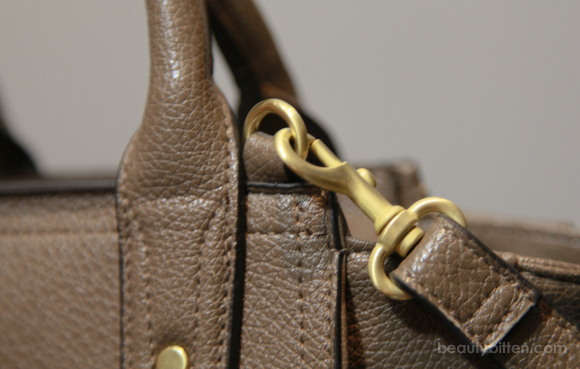 The flatness of the color is a little bit more obvious on the snap hooks of the shoulder strap of the bag. 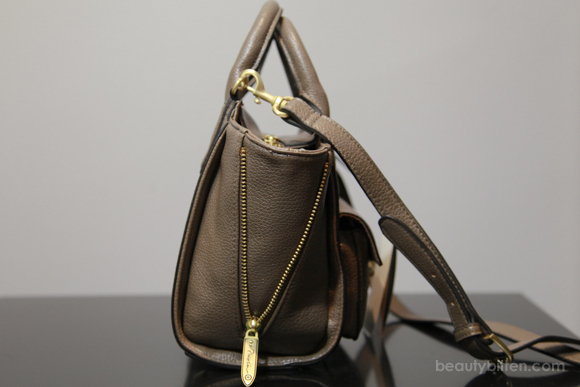 The handle is pretty stiff, and the shoulder strap is a flimsy piece of faux leather. The strap felt a little too thin for me which tells me that the material might not be able to stand prolonged wear. As far as the length of the shoulder strap, it might be a little too long for the petites. I'm 5'1, and even having it on the last hole of the strap, I still find the bag sitting a little low on my hips. If you're about my height or shorter, punching another hole or two on the strap is an easy fix. 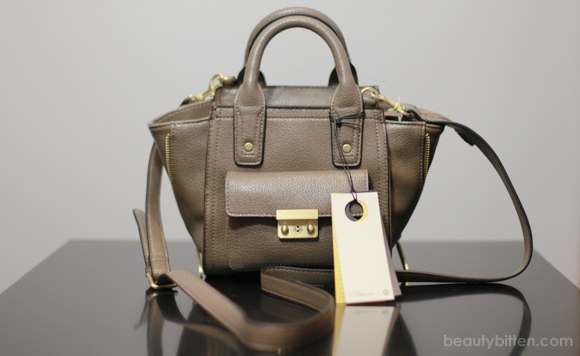 I found that the faux leather looked better in taupe for the mini satchel in person. It looks a little bit more "luxurious", has a better definition, and just has better overall look to it than the black or the yellow color. 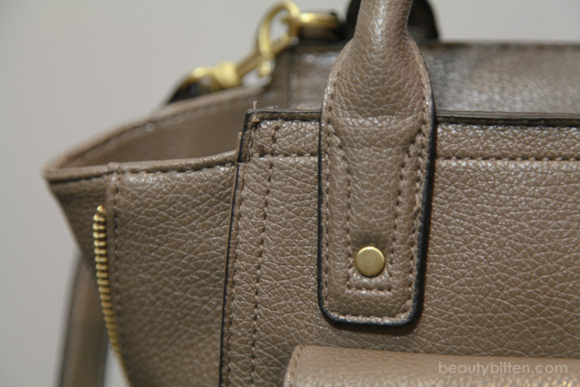 I just really love the tone of the bag, and it's also nice neutral color for fall. The black mini satchel would easily be my second choice for the obvious reasons that it's a more universal color and can easily be paired with things in your closet. 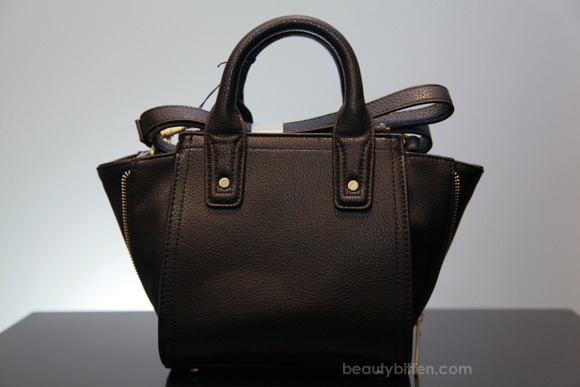 But it's also more prone to looking worn out overtime due to the quality of the faux leather of the bag. I could see that the wear and tear would be a little more obvious with the black one. The yellow color seemed to be a really popular color, but I found it lackluster compared to the taupe one. The yellow looks more of a mustard-y color. The yellow version reminded me of a little bag that you would give to your niece to play with where she can put her crayons in. I don't know why, but that's what my mind conjures when I see it. It's definitely a pop of color and meant to put some fun to your wardrobe, but I just the color didn't sit right with me at all. And to me, out of all the three, the mustard color looked a little cheap to me. I've read things online that some of the bags didn't hold up after people started grabbing and fighting for them. They ended up being casualties of the madness... damaged goods. So I'm guessing if it can't handle the stress of grabby hands, it might not stand the test of time of regular wear. The bags are pretty much worth what Target has priced them as. The quality is decent, but if they had marketed these mini satchel for let's say $50, I'd say that they're not that worth it. After inspecting the bag that I got numerous times, I wouldn't pay more for what it is. I think Target has done a great job reasonably pricing the bags with the designer name's associated to it and the overall quality. I’m happy that I was able to get my hands on it, and I bought it because I’ve always admire Phillip Lim’s work. And, I’m really glad that Mr. Lim has really put a lot of thought in his collection for this collaboration. The design on the mini satchels is still pretty amazing and solid in comparison to other bags from previous Target collaborations. They're fun, chic, and very much on trend. If you see it at Target, I would pick one up. I still think it’s a nice addition to your closet. It’s also good for those who are in a budget who wants a piece of the designer’s work at a lower price. 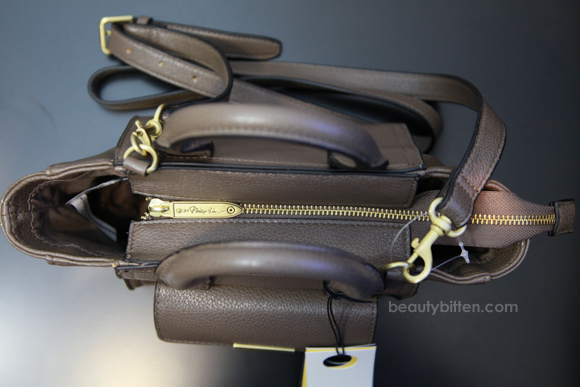 But don’t set your expectations too high when it comes to the quality of the bag. It's still a mass produced bag. If you can't find it anywhere anymore, it's not the end of the world. I really wouldn't recommend paying the mark-up price through resellers. It's just not worth the $60-100 price tag that I see they're trying to sell them for. I'd save my money and spend it on a higher or better quality bag that warrants the price. Or just really save it and buy the real thing. Paying anything over the retail price is just means you're paying for the price of FMO (fear of missing out). People cleaned out the shelves because of the hype around them prior to the release because Phillip Lim's work is a cult favorite. But the reason it's sold out is because people bought multiples of the same thing for the chance to flip them into profit which makes it a little unfair for the people who really just want one thing to actually use and enjoy. Just even scrolling through the #PhillipLimforTarget hashtag on Instagram, you'd see a fully loaded carts with just bags or posts of just multiples of the same bag. If people just don't buy any of these bags that are being resold for three times the price on eBay or anywhere online, they'll most likely end up back to Target as a return. I'm sure they won't hold on to an item that won't sell. Maybe if you’re patient enough, you’ll see it back in your Target and possibly even marked down. So just hold off on the online purchase, and check your local Target first. And be patient. People will slowly make their returns once they've sorted out which ones they'd want to keep the most. It's only been a day since the release, so everyone is still high off the hype on this bag. And with that said, the reason I had asked my mom to check for a taupe mini satchel is because I wanted to give one away on my Youtube channel because I already expected that they'll be the most popular item and the first ones to go, so I'm just holding it for one lucky person. At this point, I'm only thinking about keeping the taupe bag for myself and possibly giving the black one away as well since I just have way too many black bags in general. I'm still not sure though, but please don't ask me to sell it to you. I'd much rather give it away than sell it (or just return it back to Target). I've already posted the question on my Facebook which one do most of my readers or subscribers prefer. So if you're still highly interested in getting your own bag and you're having difficulties getting one, stay tuned to know when this giveaway will happen. Thanks for the info! I went to 2 targets closest to me, and I could not find any of the bags. Awesome review! I really dislike the fact that Ebayers and such are just trying to make a profit by doing this. I ordered a bunch of the bags too but I'm going to see which one(s) I like best and keep, return, or even see if my friends want. For girls like me who can't afford an $800+ bag from Phillip Lim, it's these types of collabos that make me happy that I can experience the bags albeit the lowered quality. What a great comprehensive review with extremely helpful photos! This was very helpful and I'm sure you've saved a lot of people a good amount of $$$ if they were thinking of buying off eBay for >$100! Great review! When I felt these bags in the store I could tell that the quality of it was definitely not worth more than what it is originally priced. I've seen these mini satchals reselling for $70 - $90! Outrageous prices for quality that isn't even worth $50. Luckily my Target still had a few of the mini satchals and I ended up grabbing one for me and a gift for my friend. I'm hoping they will restock in the Taupe color soon or get marked down in 2 weeks lol. I'm so excited for your giveaway I can't find it any where and I don't think its worth 60+ people are so selfish for taking them and reselling them. Every target should have limited people with one purse per person. But I'm glad you explained the taupe color more cause now I really want the taupe Instead of the black. excited for the giveaway:):):):):):) can you tell haha. I have been waiting for a review from one of my trusted bloggers and thank you Anne for being that person. I did try to get the bag but failed but I just said it wasn't meant to be then. Did you get any of the clothing from the collection? I still love the bags I got. Granted, it's from Target and the quality may not be up to par but I still appreciate and love my purchases. Great post. I like the black one!! Punching additional holes in the strap is genius! Ha, I'm 5"4 and the medium satchel is way too long for me. Oh, and a word of caution, I've been having trouble with the magnet closure, the magnets on both my bags got stuck to the bottom piece and now it doesn't even close! I have been waiting for a review from one of my trusted bloggers and thank you Anne for being that person.but i like the black one. Thank you! 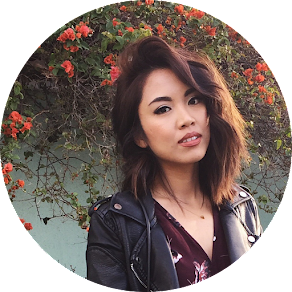 It's such an honor that I'm one of your trusted bloggers :D.
Great review! It's a cute little bag! Oh my gosh I so wish I'd snagged one of these!! Amazingly cute! !